Truth be told, learning objectives are created for the training team, not the employee. There’s a better way to describe learning experiences that is employee-centric and performance-based. In place of learning objectives, I recommend learning solution descriptions that define specific actions in the learning experience and results that describe the desired performance outcomes. If you really want to engage employees and the business, describe learning solutions in a way that shows alignment with business goals and performance requirements to achieve those goals. Show employees what the learning experience will look and feel like by describing what they’ll do. Explain how the learning experience will impact their performance by describing what’s in it for them. Learning solutions descriptions should show alignment with business goals and performance requirements to achieve those goals. What is the best way for you to communicate with someone who has a work style that might not be like yours? How can you resolve conflict? Are there differences in what motivates people in the workplace? We’ll examine the answers to these questions (and more) in the DISC program. Interpret individual styles and behaviors. Compare and contrast styles and behaviors. Describe strategies for working with different styles. Examine communication techniques for different styles. Identify what motivates different styles and what they value. Discuss how to adapt your own style to get along better with other styles. Remove communication barriers when working with people who have a style of communicating different than yours. Manage and resolve conflict by interpreting behavior instead of responding emotionally. Adapt your behavior when working with people who have a style of working that is different than yours. Lead teams into high engagement by connecting goals with individual team members’ strengths. Evaluate risks to team performance and actions to take using DISC group culture tools. This example comes from a business I worked with that replaced learning objectives for company-wide communications with employee-centric learning solution descriptions. We described learning solutions with a brief introduction, actions in the learning experience (“What will we do?”) and performance outcomes (“What’s in it for me?”). These objectives gave employees the information they needed to make an informed decision about the investment of their time for training, learning and professional development. They told them what they were going to do and the expected performance impact of their learning experience. Traditional Learning Objectives Don’t Show Alignment With Business Goals. Telling employees what they will “know” or “understand,” using the language of traditional learning objectives, does not demonstrate intentional alignment to business goals. As part of our marketing, messaging and communication strategy for learning and development, our learning solutions’ descriptions purposefully described performance outcomes that supported business goals. 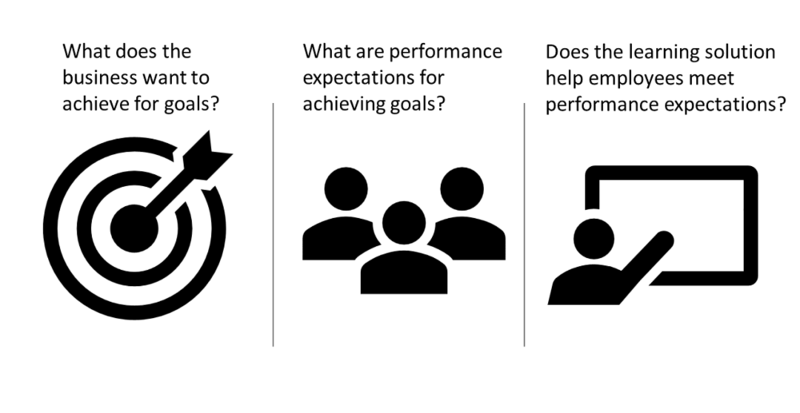 This strategy also kept instructional design focused on creating solutions and experiences that impacted performance in a way that helped employees achieve business goals. Traditional learning objectives don’t do that. Learning Experience Descriptions and Performance Outcomes. Traditional learning objectives tell us what we’ll know or understand. But what about the impact of knowing and understanding on our day-to-day performance on the job? I say goodbye to learning objectives and hello to learning solution descriptions that define actions in the learning experience and performance outcomes. Traditional learning objectives tell us what we’ll know or understand. But what about the impact of knowing and understanding?